Something I’ve noticed in the comments section of Seeking Alpha articles is the tendency of some investors to duck out of blue chip stocks at the first sign of overvaluation. Take Coca-Cola Company (NYSE: KO) stock for example. Now whichever way you slice it Coca-Cola looks expensive these days. On a historical basis the shares have averaged a valuation of around 19x earnings over the past decade. Right now they are going for something like 24x-25x estimated 2017 earnings. What about on an absolute basis relative to growth? Well, even then it still looks expensive (and possibly even more so). After all even once you factor in things like foreign currency headwinds the core business is only ticking along at a couple of points ahead of inflation. That said I’m still surprised that many shareholders seem to weave in and out of the stock. The problem as I see it with selling a company like Coca-Cola comes down to two main points. Firstly, if you’re thinking long-term then it really means you’ve got to go out and find a superior underlying business. Given that every year it is still throwing down 50%+ free cash flow relative to tangible capital that leaves your options rather limited. Secondly, you’ve got to be confident that whatever stock you end up going for is going to generate better risk-adjusted returns taking into account valuation and future growth prospects. Again, that tends to be a lot easier in theory than in practice. Oh, and there’s also the prospect of triggering an unwanted tax liability depending on how exactly you structure your affairs. When taken in combination all of these things add up to produce a rather large potential opportunity cost associated with selling. On the other hand, the attractiveness of staying put is laid bare when you consider the income side of things. 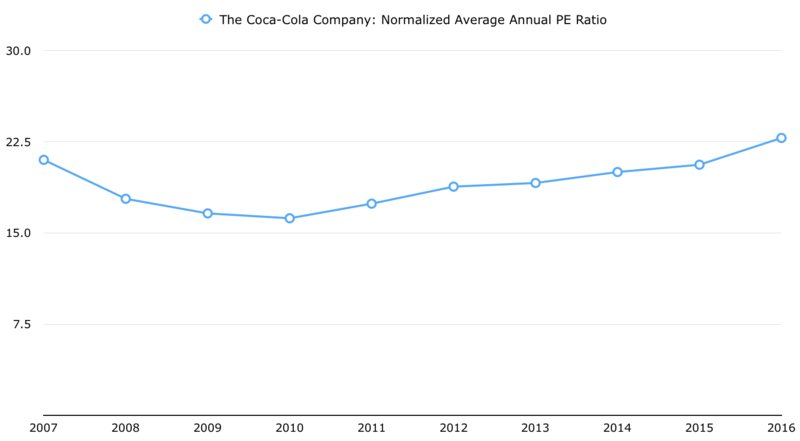 In the case of Coca-Cola we’ve got a pretty good long-term guide in Berkshire Hathaway’s position over the years. Back when Warren Buffett was first dipping Berkshire’s toes into Coke stock in the late-Eighties it was throwing off a 7.5 cents per share annual dividend (split adjusted figure) – equivalent to a yield of around 2.7% at the time. 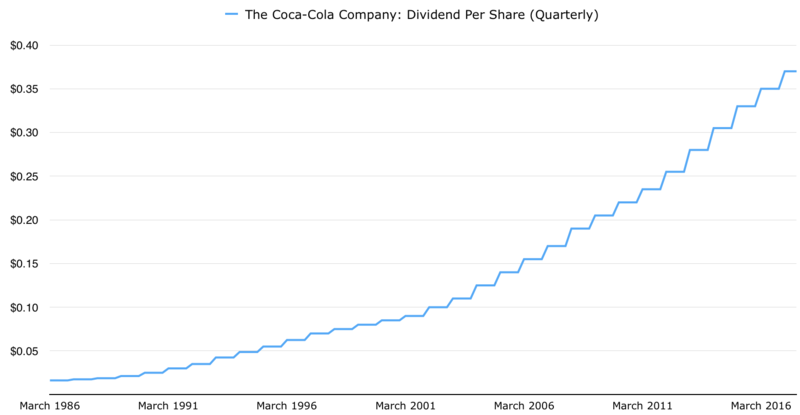 Last year, Coca-Cola declared cash dividends of $1.40 per share. In other words Berkshire has realized average annual income growth of around 11%. Not too shabby. Now at this point you might be thinking that this isn’t much of an example. After all an investment in Coke stock back in the late-Eighties was a no-brainer compared to today. This is a very reasonable point when you consider that at the time of Berkshire’s first purchases the shares were trading at around 16x annual earnings and the company had spent the earlier part of the decade growing net profits at a rate of 12% per annum. The growth outlook going forward was also superior in 1989 compared to what it is in 2017. Let’s just consider the past fifteen years then instead. Back at this point in 2002 you’d have been paying around $22.50 per share to own a slice of the underlying business. The company was looking at annual earnings of around $0.83 per share with an annual per-share dividend of $0.40. Assuming dividend reinvestment then each share purchased in late November 2007 has now grown into just over 1.5 shares, and the per-share annual dividend has more than trebled to $1.48. The upshot is that every dollar of potential 2002 dividend income is now worth over $5.50. Or put another way the yield on cost associated with that investment would be around 10%. Personally I find concentrating on that to be a better option than worrying about valuation swings in the 16x-24x earnings range. Granted, the ups and downs of the value multiple can have more profound short term consequences, but the end-game of staring at a double-digit yield on cost will invariably make it worth sticking around when the underlying business is so high quality.